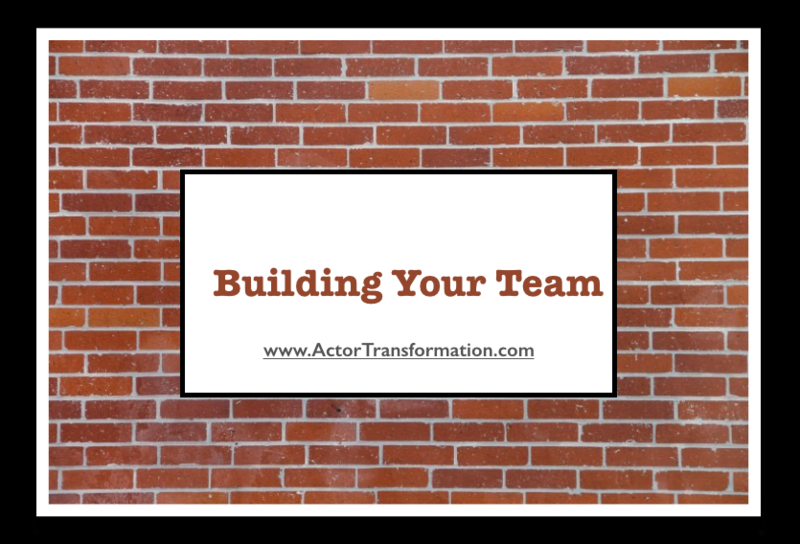 Building your team… One of the most important parts of an actor’s career. Agent, Manager, Publicist, Mentor , Lawyer, Acting Coach, Acting Teacher, Photographer, Fans, Personal Assistant, Personal Trainer, Accountability Partner, Stylist, Business Coach, and so on … Tired yet? If you are reading that long list and saying to yourself “I can’t do that” or “I don’t have the money” or “I’m not at that level yet”, please take a deep breath and look at each one before putting up your barricades. Many actors believe that getting a team is something that one does AFTER becoming famous. But having a team behind you often becomes a major contributor to becoming “successful” in the first place. ~ Agents and managers work on commission. So the only time you pay them is if you are making money from the work they got you. This is sometimes true of certain lawyers as well. ~ There are many photographers, personal assistants, stylists, etc… that might welcome barter. Doesn’t hurt to ask! Think about what your skills are and what you have to offer others. You might be surprised how your time and expertise can be more valuable than the mighty dollar! ~ If you have superstar aspirations but are trying to make in Hollywood on a Starbucks paycheck, you must think above and beyond your current circumstances. Many designers want their gorgeous clothes on red carpets and shown in magazines. If you can borrow designer duds and get a great picture in their latest threads at a big Hollywood party or your next film festival, etc… You are doing THEM a favor in return. Win Win! ~ Mentors and fans only get paid with your sincere gratitude and appreciation. ~ There are an abundance of very affordable acting classes in Los Angeles . (And many other locations as well). Contrary to popular belief, You don’t always need to spend $300 per month for an great acting class. Do what you can. Practice at home if you need to, but make sure that you keep working on your craft. ~ An accountability partner is someone that helps you stay on track with your goals and in return, you help them right back! You can create a group of friends to do this as well. Just make sure that the people who are invited into the group are responsible, proactive, and drama-free! ~ One of the most overlooked team members? (Yet should probably be one of the top on actors list?) … The business coach. Remember that there is no shortage of fabulous, talented actors in LA and NY. There are thousands. Actually hundreds of thousands. But many actors will never succeed because they really don’t understand the business side of the biz. (Which is MUCH more than just getting a headshot, an acting class, and an agent.) Find a business coach that has extensive knowledge of the entertainment industry who can nurture you and give you a kick at the same time! ~ And the most valuable team member on your team? … YOURSELF. Make sure that you keep proactive and positive no matter what this crazy career may throw at you. Be kind to yourself and find a way to retain a sense of peace and happiness in your career and in your life. Make sure that you enjoy your own company and that you feed your mind with great knowledge and positive thoughts. Other people will come and go in and out of your life but the one person on your team that you cannot get away from is … well… YOU!